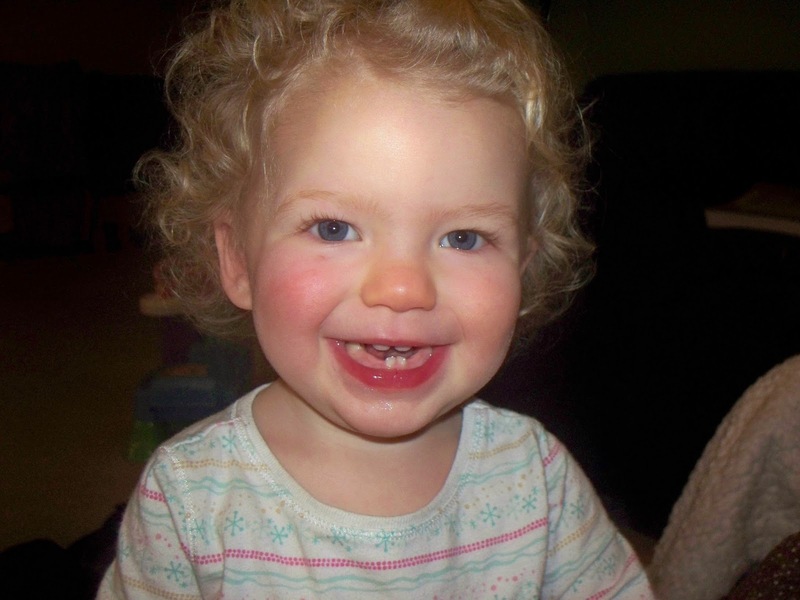 I remember all too clearly March 2013 when my precious Bug was born. I remember thinking, "My God, if I can just cuddle her forever and ever, my life would be perfect." Real life isn't just snuggles, though. We have been incredibly blessed to find ourselves in the exact situation (short of being gifted with $50 million) we have desired during our years of raising up children: I work full-time and Jason stays home with Bug (and soon, the new baby, too!). 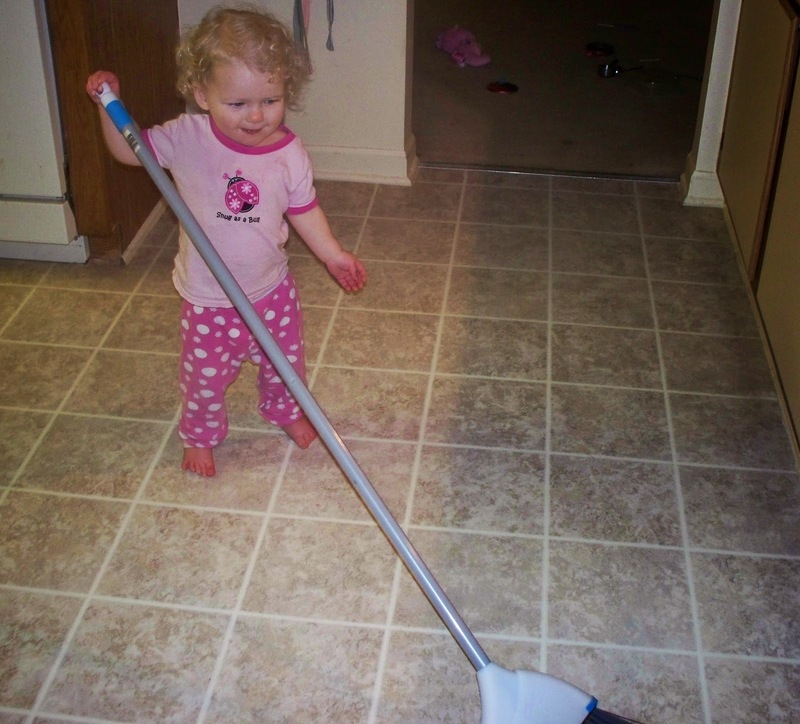 We're so happy to be in this situation, but as all you parents well know, there's never enough hours. I come home, we eat dinner, we play, then it's bath time, followed by snuggle time and a little movie time, then it's "getting out the last of our wiggles" time, then bedtime. That's it. In my spare time, I have so many hobbies and interests to pursue. There's always a good book to read, there's always something that needs planned or done for mama group at church, there's always a chore to complete so our home is a peaceful place to live, there's always a new recipe to try, there's always something to research (how many teeth should Bug have by now? is she sleeping enough? 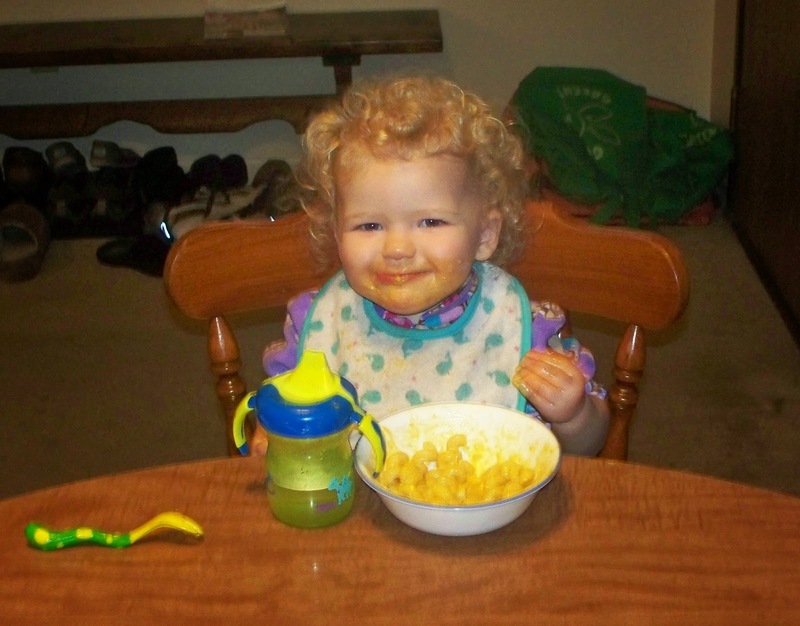 which foods are best for brain development at age 2?). And by spare time, I really mean the rare occasion I find myself pooping alone. That's really when I get my best stuff done. I'm laughing, but I'm honestly serious. This blog was never meant to be #1 in our lives, and honestly? It never has been. We've never struggled with keeping our priorities straight: God, our family, work, then play. But in that "play" time, we've put the blog before other things. We've crafted less, played games less, read less. Instead of spending a leisurely evening reading, we've spent an evening writing blog posts. And it's time that changed. Over the past 3 years, Jason and I (and now Bug) have loved sharing our lives with you. This blog and its accompanying Facebook page have provided many hours of entertainment, comraderie and community. You, readers, have stretched us to think further outside the box than we ever imagined. You have cheered us on in tough times and rooted for us in great times. You have changed our lives forever. Back in March 2013, I was already thinking ahead. I knew the end would come soon. I had imagined the end would be December 2013. But then I found myself without a job and with a lot of time I could devote to our blog. But then, life changed again. Not only did I find myself with a job, I also found myself with child! We have prayerfully considered when would the best time to end this blog, if ever, and my friends, that time has come, but I don't know that it's really the end. Does anything really ever end? This blog will remain in existence, so any recipes you have loved, any crafts you want to make, they will all be here, waiting for you. We will keep our Facebook page up and active - it is one of Jason's favorite things, although admittedly, he often has little time to chat with you all there. It is a goal of his to be active more there now that he will be freed from writing posts here! I don't know if we'll ever come back to this space to share again, but I imagine one day, we will share again. We have so loved having you all in our lives and sharing with us. We pray the coming days, months and years are good to you and yours. You will always be on our hearts, in our minds and part of our prayers. Love and hugs to you all. Christmas Countdown: Christmas is just 3 days away! I found this idea in 2013 and instantly fell in love. 1 - I had all the ingredients in my house, so I could whip it up right then and there. 2 - I love this idea as part of a family gift. Kids, in particular, would enjoy this idea. May I also suggest you add homemade marshmallows and/or chocolate covered spoons to the gift? 3 - Dudes are so difficult to find good quality homemade gifts for. But I don't know any dude who doesn't like food. Mix all items together in a bowl with a whisk. Scoop the mixture into Mason jars. That's it! How simple is that? 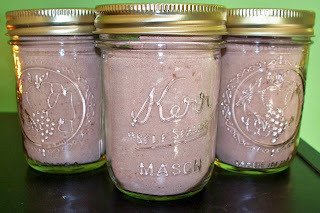 I was able to fill 5 half-pint Mason jars with one batch. While this isn't a free gift, it did cost nothing out of pocket to me at the time I made it since I did have all the ingredients in stock. Even if you have to buy some items for this, it is very low cost! One of my favorite things to do at Christmas is make up care packages for my family and friends. I will be including this in care packages from now on! 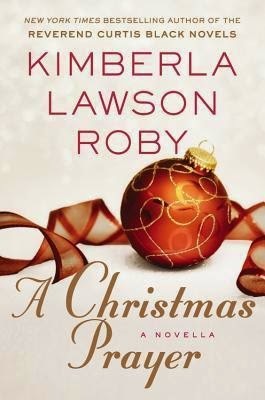 You can read part 1 of my Christmas book review posts for 2014 here. Katherine Zook and her four children are facing their first Christmas without a loved one, and the future seems dim. But when a mysterious "Englisch" man begins to show up in the most unlikely of places, Katherine can't help but be suspicious . . . and a bit curious. When Joy Stolzfus's boyfriend tells her he wants to court other women, she's shocked. She pours her heart out in a letter, but it mistakenly reaches Noah Esh. The two begin writing letters back and forth, but a misunderstanding threatens to topple the relationship they re building. Anne Marie Smucker's life is pretty perfect. Until she discovers her widowed mother is getting married and they're all moving. On top of that, Anne Marie's relationship with her friend Nathaniel has changed, and she's more confused than ever about her feelings for him. 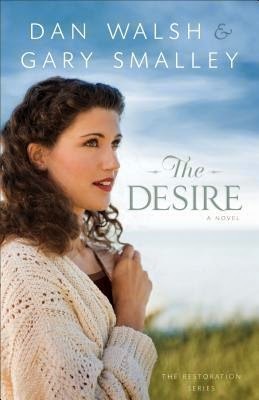 My thoughts: I love these Amish novella collections! Not only do I get the chance to enjoy authors I already know I love (like Beth Wiseman), but I often discover new authors I hadn't read before (like Ruth Reid). The authors tend to change for the collections, though Beth is usually always included. 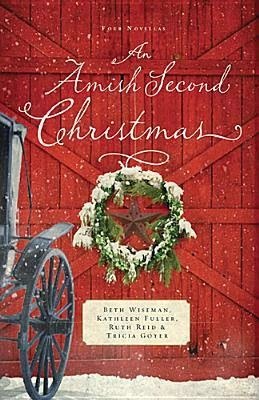 If you like Amish fiction, you'll definitely want to read this book during the Christmas season. Alexis Fletcher hasn't had a merry Christmas in five years-not since her mother passed away. Every December she remembers the joy her mother brought to everyone during the holiday season and feels the pain of her absence, even more so now that she and her sister are barely speaking. More than anything, Alexis wishes her family could be whole again. However, with her wedding fast approaching, Alexis might just be ready to make some holiday memories with a new family of her own. Alexis's fiancé, Chase Dupont, is everything she ever dreamed of. He's kind, handsome, fully supportive of Alexis's career, and the CEO of a large company. But outside forces threaten to derail this happy couple from ever reaching the altar. As tensions rise, a dramatic event causes Alexis to question everything. Will fate give her what she needs to finally embrace the season that has brought her so much pain? Will Alexis get her wish for a happy holiday? Or will her Christmas prayer go unanswered? My thoughts: It's hard to say how much I liked this book. The plot and characters thoroughly entertained me and the book was a quick read. I certainly wanted to find out what happened with the story, but this book did not necessarily put me in the Christmas spirit. I did not find the characters very relatable. If you're looking for a Christmas book, I would skip this one. If you're looking for an entertaining piece of fiction, this is right up your alley. My thoughts: This book definitely tugged at my heartstrings. I can't imagine my life without Jason in it, and this is even more true now that we have children together. My Bug absolutely adores her papa, and the idea of her in this world without him just... it's heartbreaking. The author's writing style is a bit stilted and cold, but I did enjoy reading the story. Overall, I would recommend reading this book. Our $92 grocery trip + what's for eats this week! We shopped at two stores this week: Target and Walmart. I had some Cartwheel coupons for a couple of items that are only available at Target in my area. We shopped at Walmart for the majority of our supplies, though. Honestly, kids don't need kid-specific snacks, but I have found that what works best for us to have pre-packaged snacks on hand for Bug for days when our sanity has left us, when we're not going to be home for long stretches of time and when convenience is just better in the moment. 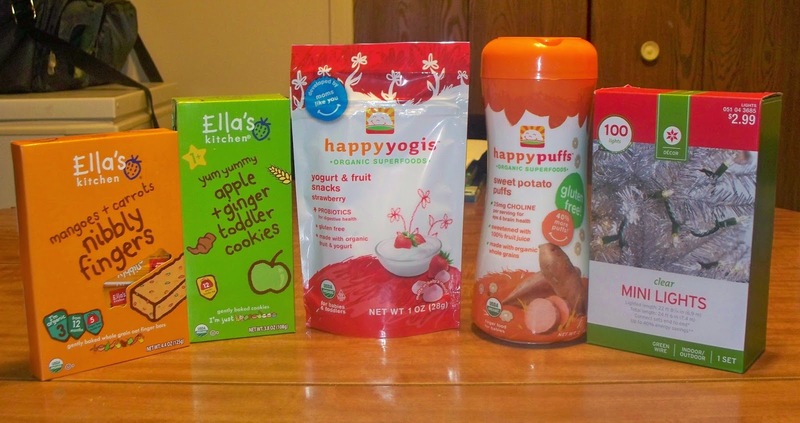 We also have found that what works best for us is to buy only organic snacks for her. Obviously, you should do what works best for your family, and that may mean buying non-organic snacks, making your own snacks or a whole other option I haven't mentioned here. We spent $18 at Target. 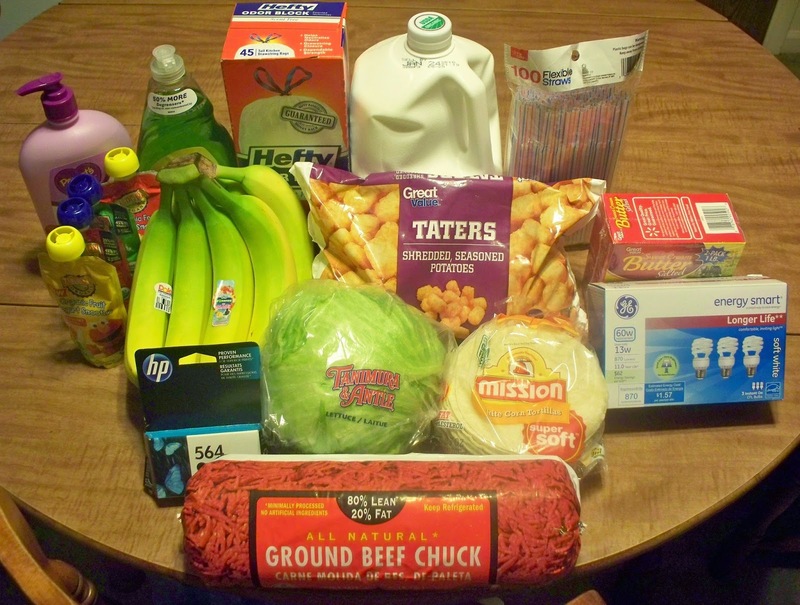 We spent $74 at Walmart, which brought our total grocery expenditure to $92 - not bad for buying so much general merchandise! Our menu is pretty simple and many ingredients are those we already have in the pantry so we were able to buy the general merchandise items we needed while staying within our grocery budget. Through The Family of Jesus, listeners will develop an emotional connection to the family members of Jesus, learning about their lives and falling in love with Scripture along the way. Bible studies and devotionals abound, and in churches everywhere people gather to seek a deeper understanding of God’s word and its application to their lives. 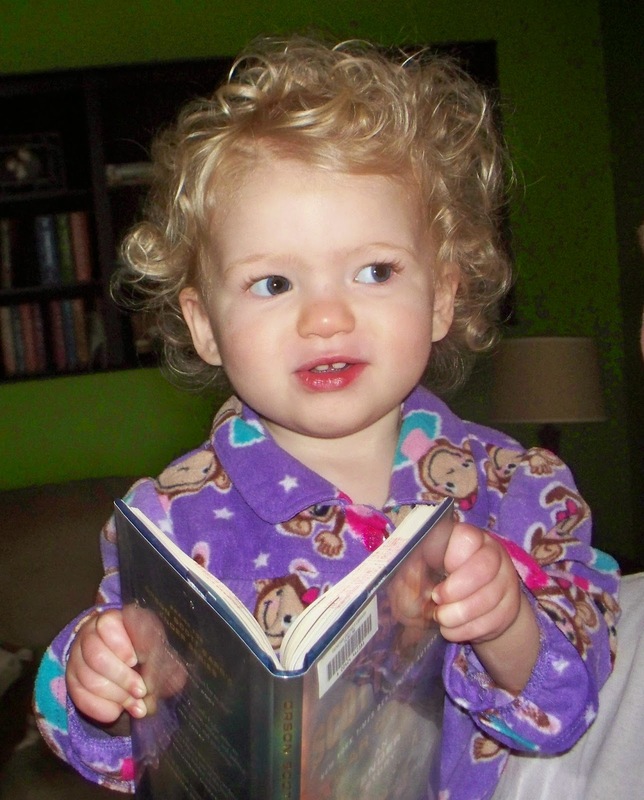 But too often these studies engage only the analytic approach to Bible learning. 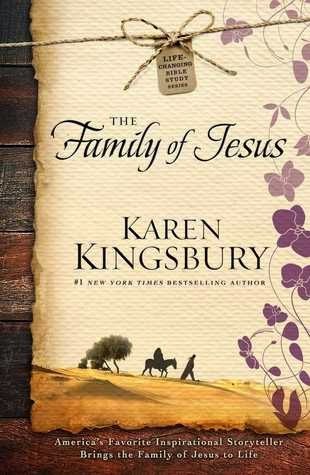 In The Family of Jesus, #1 New York Times bestselling novelist Karen Kingsbury will make you laugh, cry, and ultimately care more deeply about the Bible by helping you grasp the truths in Scripture not just with your mind, but with your heart. The characters in these short stories were among those closest to Jesus—Mary, Joseph, Jesus’ brother James, John the Baptist, Zechariah, and Elizabeth. Each has a compelling tale to tell. Kingsbury intersperses fictional, emotionally gripping details anchored in Scripture with historical and theological insights and questions that will guide soul-searching and reflection. The Family of Jesus not only provides a deeper understanding of the relatives of our Savior, but also helps listeners acquire tools that will draw them closer to Christ, to the Scriptures, and to each other. Additional notes: This book is part of a new series called Heart of the Story: Life-Changing Bible Study. There will be additional books released as part of this series, each exploring a different facet of Jesus' life and the people in it. My thoughts: I thoroughly enjoyed this book. I did not do a lot with the Bible study at the back and feel this would be much more useful in a small group setting rather than just a person going through the study, but I would highly recommend this book to anyone. I love any resource that breaks the Bible down for me in a way that I can easily grasp the concept, then I can go back to my Bible, read the actual words and gain new understanding. I am very excited about the other books that will be coming out in this series! 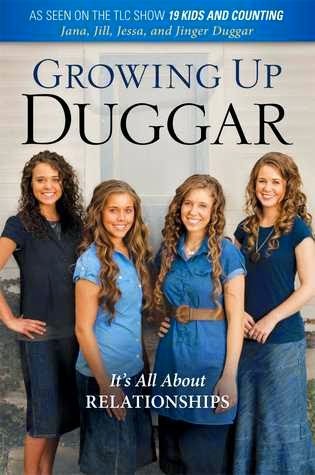 In this delightful and very personal book, the four oldest Duggar girls share their hearts and their core beliefs, explaining that it's all about relationships! Relationship with self: The girls share their own personal journeys to self-acceptance and navigating the difficult stage of adolescence. Relationship with parents: You'll find revelations about how Jim Bob and Michelle keep the lines of communication open with their children. Relationships with siblings: Here, you'll get a peek into the Buddy system, how the siblings handle conflict, and how the loss of little Jubilee (their sister) affected their relationships with each other. Relationships with friends: You'll find principles on how the Duggar kids deal with peer pressure and how they interact with friends outside their family. Relationships with boys: You'll learn the Duggar view of dating and courtship, and these four sisters will address the often-asked question of when one of them will get married. Relationship with God: And woven throughout the book, the girls talk about their most important relationship of all their relationship with God and their own personal faith and beliefs. This candid look into what Jana, Jill, Jessa, and Jinger believe and why they believe it will give you practical insights into your own life and will inspire you to evaluate principles that will work for you. My thoughts: While this book was aimed more toward younger ladies, I felt I learned a ton from this book on how to communicate with my daughter as she grows. Jason and I do plan to pursue courtship for our kids instead of allowing them to date in the way people date now. 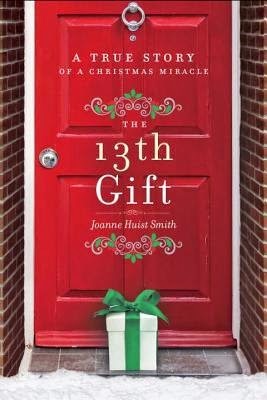 This book was very useful in breaking down courtship as the Duggar family does it. No matter what anyone says about this family, first and foremost, they love God and seek to honor Him, and that's a family I want to learn more about. Additional notes: This is the third book in the Restoration series. You can read my review of the first book here and the second book here. This is the latest book in the series. My thoughts: To be perfectly honest, I despise the cover. It makes the book seem so trivial and girly, and it's not really like that. This entire series is built around showing an honest look at relationships and the way they, and the people in them, evolve. While I wasn't a fan of Michele as a character (far too whiny for my taste), I appreciate the author's style and message. husband Luke in LA—city of herbal smoothies, multimillion-dollar yoga retreats, and the lure of celebrity. Luke is there to help manage the career of famous actress Sage Seymour—and Becky is convinced she is destined to be Sage’s personal stylist, and go from there to every A-list celebrity in Hollywood! But things become complicated when Becky joins the team of Sage’s archrival. How will charming and supportive Luke deal with this conflict? Is it possible that what Becky wants most will end up hurting those she loves most? 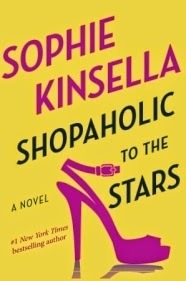 Additional notes: This is the seventh and latest book in the Shopaholic series. It is revealed at the end of the book that more books for this series will be released. You can read my review of the sixth book here. My thoughts: You know, I thought the cover was a bit odd and not in keeping with the other covers for this series. And I have to tell you: I was completely right. While I adore this series as a whole and will continue to read these books because Becky is hilarious, I'm so disappointed. The author has definitely changed the face of this series. This book was more of a mystery-type book, and the ending was just horrendous. If you have loved this series thus far, you'll want to read the book, but my goodness, I am not a fan of this book. Hilary Westfield is a pirate. In fact, she’s the Terror of the Southlands! She’s daring, brave, fearless, and . . . in a rut. Maybe she hasn’t found any treasure lately. And maybe she isn’t fighting off as many scallywags as she’d like. But does that mean she and her loyal crew (including a magical gargoyle) deserve to be kicked out of the ranks of the Very Nearly Honorable League of Pirates? There is only one thing to do—find a daring mission worthy of her fearless reputation. With the help of first mate Charlie, finishing-school friend Claire, and the self-proclaimed intrepid gargoyle, Hilary sets sail on a swashbuckling expedition that may or may not involve a kidnapped Enchantress, bumbling inspectors, a mysterious group called the Mutineers, and—the most terrifying thing of all—a High Society ball. 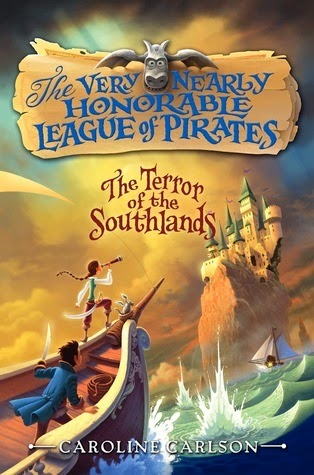 Additional notes: This is the second book in the Very Nearly Honorable League of Pirates series. You can read my review of the first book here. My thoughts: It is honestly shocking to me that not everyone reads this series. First of all, the book features silly pirates. Second, the main character in this pirate book is a girl who is a pirate. I love that more than I can ever say. Third, there is no sort of love story for the girl pirate (at least in this one or the first one and I highly doubt for the third one). While I enjoyed the first book more, I still love this series and think everyone should read it. We saved a ton of money this month, but we also spent a ton of money this month. Once the new baby arrives, we plan to move Bug to a convertible car seat. To do that, we needed a convertible car seat. Since the summer, I have been looking at car seats online. I finally decided on one from amazon.com. It was $160 normally, and I added it to a wish list so I could monitor its price. The weekend before Thanksgiving, the price dropped that weekend only to $116.99. I purchased it then and saved us quite a bit! We had been looking at getting Veggie Tales' All the Shows Volume 1 for a family Christmas present this year. This volume is normally $49.99, so it was definitely a pricey gift, but one we would use again and again and all enjoy together. The week before Thanksgiving, the entire Veggie Tales website (minus a few select items) went on sale 40% off and free shipping. I was still committed to getting just the one volume, but that was one of the select items not on sale. So for $41.99, I purchased Volumes 1 and 2 together. I paid less for both than I would've for one! Bug loves eating at the table with us in her booster seat! Also on our list for Bug was a booster seat for the dining room table. I wanted one that not only just strapped her into the seat but also one that strapped onto the seat. These kinds of seats can be kind of pricey. When I shared some of the things we were looking for on my personal Facebook page, a friend quickly offered up her son's booster seat for us to have... for free! I'm so thankful for generous friends, and Bug loves being in her new seat. 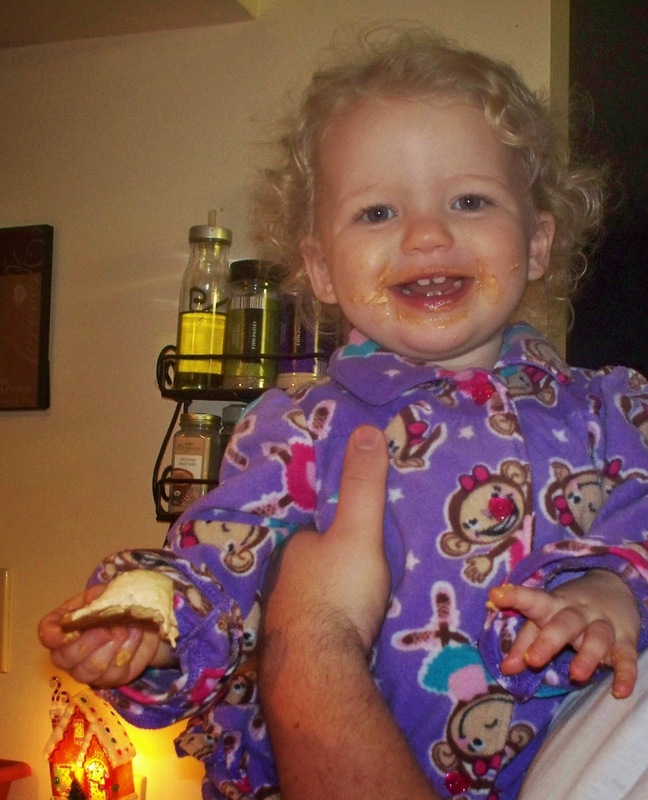 We took her high chair to my parents' house so she has something she can use there, and we'll get a space-saver high chair that can convert to a booster seat once the new baby is ready for that. It's a really long story (and complicated), but I found myself in need of more/extra maternity clothes. Thankfully, Motherhood Maternity online was running a special buy two, get one free on all their pieces, plus free shipping. I bought a pair of jeans, a nightgown/robe set and a hoodie. Their items are pricey, but I saved a bunch of money by shopping at the right time. Jason didn't tutor at all this month, but he picked up several mystery shopping assignments. We all enjoyed the free food, and all the money he earns is going toward a Boba carrier for the new baby. Bug had several play dates this month; we went to two different friends' houses and they all served us dinner. We had a friend and her son over this month, and they brought things to cook us dinner! We're very blessed and so thankful for good people in our lives! Jason and I have been so prudent to complete Bing and Swagbucks activities each day. We spend very little time on this, but the time we do spend is quite enjoyable. I don't know why we like it so much, but we do. We also run Perk on our iPod (which is technically broken but can be used for running Perk and things like that). 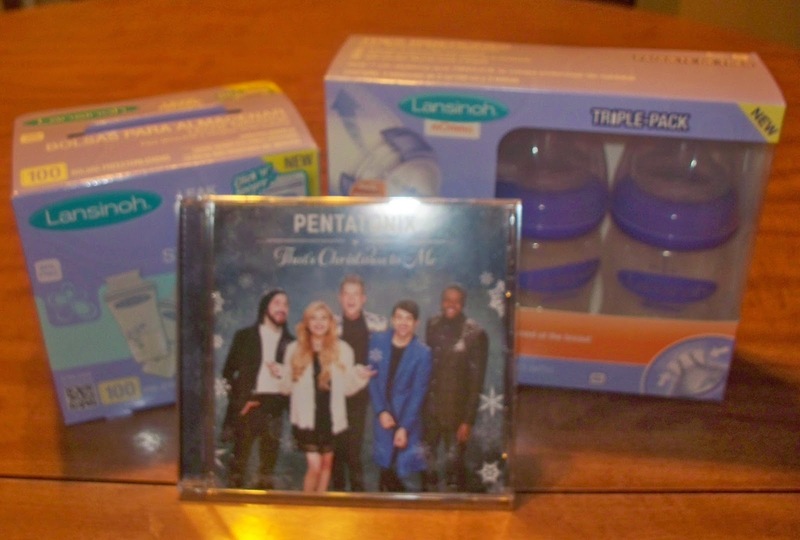 With money we earned, we bought 100 breast milk storage bags, three bottles for the new baby, the newest Pentatonix Christmas CD and a tube of Burt's Bees diaper cream (the best diaper cream we've used!). Our cost out of pocket was $0. I will also tell you we have a *ton* of items that will be arriving in our December order. We've really been working these programs and are so happy with all the items we've been able to get! It makes a huge difference in our budget. We're not huge day-after-Thanksgiving shoppers, but we did take advantage of a sale going on at Babies R Us. 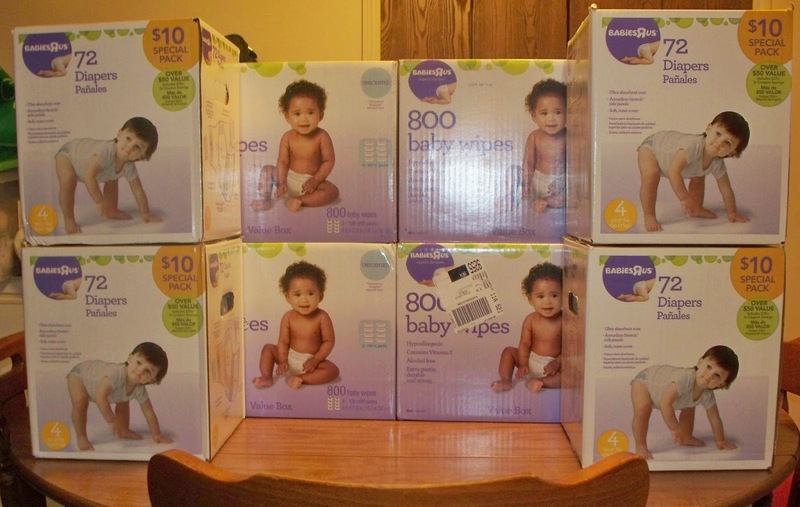 Diapers and wipes were on sale for $10 a box. We bought the maximum allowed limit for each item. I also make a point of shopping at CVS during the week of Thanksgiving. We've spent $13 out of pocket so far and got 2 candy bars, a box of cereal, 2 bottles of laundry detergent, 9 rolls of paper towel, a travel package of wipes, toothpaste, Combos, Kraft Macaroni and Cheese, canned green peas, and a bottle of VitaminWater. So far, that works out to just 65 cents per item, which is a great deal on all of those items. I cut Jason's hair, and he gave me a pedicure (minus polish). We made lots of turkey stock from our Thanksgiving turkey. I've been really prudent to use our cloth TP as much as possible, to the point that I really think I will need to make more. Now that Bug is using a napkin at dinner, I can see I will also need to make more cloth napkins in the future. I made a bunch when she was born in anticipation of this, but now with another little on the way, I'll need to make about 8 more. November was so relaxing and fantastic. I kind of want to re-live it! Early in November, a friend and her son came to play. Bug loves play dates! Later in the month, we went to their house to play. A friend watched Bug for us so we could have a date night. We had a blast picking out her stocking stuffers and having dinner together. Bug had a great time playing with our friend and her children. We decorated our home for Christmas, and Bug did a great job helping! She caught on very quickly to hanging ornaments on the tree. Earlier in the season, I made a Christmas activity for her and just put it up in November. It's super easy to make and gives Bug the chance to decorate her own tree over and over and over again. We live in Michigan, and it snows a lot here. I love winter, but Bug is still warming up to the idea. We got a few inches a week or so before Thanksgiving. Jason took her out, but she sat down in the snow and refused to move. We have some work to do there! It didn't really snow again, but I'm sure it will in December. We usually stay home for Thanksgiving because it's a nice day to relax and play together. We cooked a pretty simple feast, and it took hardly any effort! Later in the day, we surprised my parents with a visit. I didn't want to tell anyone we might come because it was literally a "let's see how we feel and how Bug is" kind of thing. It was nice to visit. After Thanksgiving, we spent most of the weekend at home, baking, cooking and eating. Yum!